Moray is a great location for spa breaks in Scotland. This area of Scotland has lots of things to do and good weather (although we cannot guarantee this!). Explore beautiful coastal towns and visit lovely, quiet beaches. Discover the historical market towns and visit Speyside, famous for it’s whiskey. Whether you are into outdoor pursuits such as mountain biking and watching dolphins or you would prefer to tour distilleries, visit castles and exploring museums then Morayshire has an abundance of attractions and activities to offer the spa break visitor. 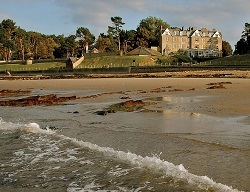 We have two hotels offering spa breaks in Morayshire, Scotland. The Eight Acres at Elgin and the Golf View Hotel in Nairn. Each offer similar spa packages as they are both part of the Crerar Hotel Group. Stay on a one night or two night spa break including dinner, breakfast and a choice of spa treatment. Choose either a Back, Neck & Shoulder Massage, a Taster Facial or a Lime & Ginger Salt Glow. Stay on a Sunday night and receive a special reduced price plus a discount on spa treatments. All our breaks include use of the leisure facilities which include swimming pool, sauna, spa bath, extensive gym and squash court at the Eight Acres Hotel and outdoor hot tub, swimming pool, Jacuzzi, sauna/steam room and gym at the Golf View Hotel. For more information on any of our packages featured on our website or to check availability please call us on 0800 246 5511.